Joseph Conrad penned his novel The Duel in 1907. Seventy years later, Ridley Scott adapted it to the screen in his debut film, The Duellists (1977). But the origin of this story transcends Conrad’s own novel. Both the book and the film are based on true events—specifically, on a historical incident that appeared in the pages of nineteenth-century newspapers. The incident concerned two army officers who had been engaged to duel for over a decade and for no apparent reason. This historical event presents two essential features for adaptation. On the one hand, it is an extraordinary account because it narrates the progression of an almost never-ending duel. On the other, the reasons for the duel were unknown. The combination of both elements produced a storyline that was a hybrid of historical chronicle and mythic tale, which has resulted in various versions of the historical event, adapted in two different genres and media: a novel and a film. This double process of adaptation from historical duel to novel and from novel to film implies an act of narrative comprehension. Drawing on Ricoeur, this implies understanding that the meaning of the past is unfinished and in a continuous “process of interpretation” (Gabilondo and Aranzueque 30). In the three accounts analyzed in this article—the journalistic, the novelistic, and the cinematic—the same story is told. However, the poetic evolution of the anecdote through the process of adaptation presents noteworthy contrasts. The definition of the duel and its historical context have been taken into account in this comparative analysis. It must be emphasized that the narrated duel astonished society because it was seen as sensational at a time when tradition was changing. In marked contrast to the rationalist trend then in vogue, the act of dueling involved breaking military directives, which had become particularly strict in the prosecution of such male customs. The duel was regarded as an antiquated practice and, when it arose between soldiers, a grave lack of discipline. The story transpires during the apogee of the Enlightenment. This contextual framework facilitates the comprehension of the cultural significance of the “duel.” The duel is a type of semi-private activity that is grounded in the value of honor and runs completely counter to the rigidity imposed by the Napoleonic army. Accordingly, it becomes a symbolic act of rejection towards the new status quo and a means of masculine escape. In addition to representing the emotions associated with it, such as revenge, rage, or pride, the duel paints the portrait of a historical period marked by the coldness of reason. In short, it may be concluded that the separate accounts offer a perspective on the spirit of the times in which each was produced. Firstly, the viewpoint of the journalistic chronicler who lives the events in person, experiencing the collective astonishment. In this case, the anecdote has a ludic function. Secondly, that the view of the novelist who provides an ironic account of the characters and the absurdity of certain human acts, but also amplifies the anecdote’s dramatic import and the profound meaning of traditions. Thirdly, that the vision of the film director who, with a sense of nostalgia and melancholy, contemplates the defense of honor from his vantage point at the end of the twentieth century. From these three perspectives, the myth of the duel is reaffirmed: a vestige of remote times that continues to survive today in a shared cultural imagination, but also in a poetic space of historical origin, mythologized through its multiple revisions. Conrad said he based his story on an anecdote that appeared in newspapers from southern France about a duel that occurred between the years 1794 and 1813. Stape and Peters have compiled several texts that mention this anecdote, bringing together at least twelve sources that may have inspired Conrad’s novel. But to their mind, doubt remains about the original source that Conrad drew on for his narrative (Stape and Peters 1-5). According to Ferguson (385), the American Harper’s New Monthly Magazine published a brief article on September 1, 1858 that, judging by its similarities to the plot in Conrad’s novel, could also be its main historical source1. If Ferguson is correct, it may be supposed that Conrad had read the fragment published in Harper's as well as those found in the French press. Then again, this piece of information does not invalidate Conrad’s vague recollection concerning the story since, as we shall see, a similar anecdote appears in various contemporary sources. Its pedigree is extremely simple. It springs from a ten-line paragraph in a small provincial paper published in South of France. That paragraph, occasioned by a duel with fatal ending between two well-known Parisian personalities, referred for some reason or other to the “well-known fact” of two officers in Napoleon's Grand Army having fought a series of duels in the midst of great wars and on some futile pretext. The pretext was never disclosed. I had therefore to invent it; and I think that, given the character of two officers which I had to invent, too, I have made it sufficiently convincing by the mere force of its absurdity. It is possible to deduce from Conrad’s words (1) the remote journalistic origins of the story, adapted to book and screen; (2) that the context of the duel is the Napoleonic Wars, a space that amplifies the mythic elements of the original account and traces ironic and narrative parallels between the historical sequence that captures “(…) [Napoleon’s] duel against Europe” and the duel between the two army officers; and (3) Conrad’s need to invent a pretext to make the novel convincing and distance it from the absurd, while also using the absurd ironically as a convincing cause of the duel. Nevertheless, the pretext invented by Conrad was “futile”: on the one hand, he respected the real sense of irrationality of the anecdote and, on the other, the need to generate sufficient dramatic tension in the novel. As a result, Conrad wrote a novel that seemed “tedious” to critics such as W. L. Courtney (Stape 42-46). Ferguson reinforces the hypothesis that Conrad took the anecdote practically whole—including the power of the absurd—from the section “Our Foreign Gossip” (385-388), and that he made only two modifications and one addition: he changed the ranks of the soldiers, demoting them; moved the dates of the duels forward from 1794 to 1800, which, according to Ferguson, enables Conrad to frame the action in the Napoleonic Wars, “(…) with the discipline and glamour of Napoleon always a part of the picture” (388); included more characters that enrich the story’s atmosphere by providing a psychological analysis of the individuals; and lastly, portrayed the first and fourth duels without witnesses, a tactic that, Ferguson believes, gives the story an epic gloss2 (389). The anecdote is presented as follows in the “Our Foreign Gossip” section of the column Editor’s Easy Chair in Harper’s New Monthly Magazine (559-560). In 1794, then, there lived a Captain of hussars, Fournier by name, at Strasbourg, who was the most hot-headed and quarrelsome man in all that region. Again and again he had slain his man in duels, but no successes seemed to satiate his taste for this sort of murder. Two captains of the Champagne regiment, La Fenestre and d'Agay, had been mortal enemies for twenty-eight years, and had met seven times on the field of honour. La Fenestre had his head blown off by a cannon ball at Vellinghausen, but his partisans noted with a point of pride that a fragment of his skull put out d'Agay's right eye (78). 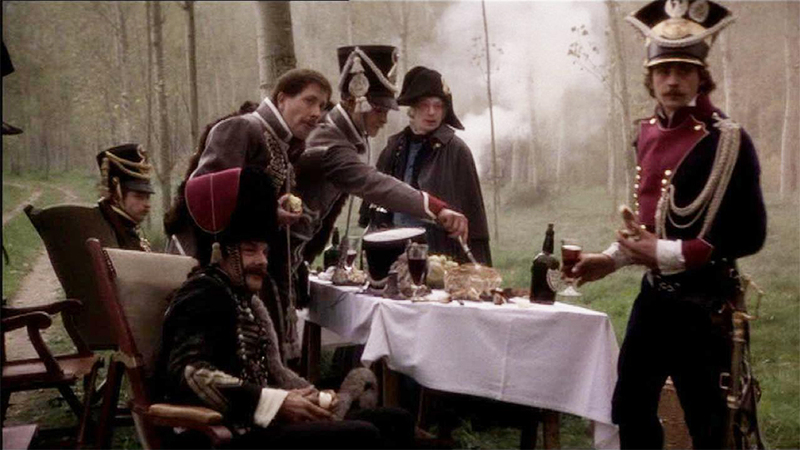 In this case, the setting is the Seven Years War and not the Napoleonic Wars, as in Conrad’s novel and Scott’s film. And three further differences may be noted. Firstly, this fragment expands the duration of the duel to twenty-eight years, considerably lengthening it with respect to the duration of the fictional accounts; secondly, the names of the military protagonists change (La Fenestre and d’Agay), although the initials of the protagonists in Harper’s, Conrad, and Scott remain the same: Fournier-Feraud and Dupont-D’Hubert; and, finally, the episode stresses “pride” as the main passion that might account for how a duel might be sustained for no apparent reason. A captain of hussars, named Fournier, who was a desperate duellist, and endowed, as the French say, "with deplorable skill," had challenged and killed, on a most frivolous pretence, a young man, named Blumm, the sole support of a family. At the event the entire town put forth a cry of lamentation — a cry of malediction on the murderer. The young man's funeral was attended by an immense multitude, and sympathy was felt for the bereaved family in every household. There was, however, as it happened, a ball at the quarters of General Moreau. The ball was expressly given to the citizens of Strasbourg, and the General, apprehensive that the presence of Fournier might be offensive to his guests of the evening, charged Captain Dupont, his aide-de-camp, to prevent him from entering the ball-room. He accordingly posted himself at the entrance, and when Fournier made his appearance, he exclaimed, "Do you dare to show yourself here?" "The deuce! what does this mean?" asked Fournier. "It means," replied Captain Dupont, "that you ought to have understood that on the day of the funeral of poor Blumm, it would have been only decent to remain at home, or certainly not to appear at a reunion in which you are likely to meet with the friends of your victim (70-78). It was in 1803 that Captain Fournier of the Chasseurs, and Captain Dupont of the Hussars, commenced a duel which lasted nearly five years. Fournier was the most famous duellist in the French army at the time. He was a skilful swordsman, and even more skilful with the pistol. When quarrels were scarce, he would frequently smash with his pistol-balls the pipes in the mouths of soldiers, who sat unsuspectingly thirty paces away. And quarrels, of course, became lamentably scarce with such an expert as Fournier, and the soldiers, becoming wary, would not sit out-doors as usual, nor in fact at their windows, with their pipes in their mouths. While matters were in this strait, young Blumm, a wealthy burgher, who had been roistering around Fournier's quarters in Rouen, one evening, was found a corpse the next morning, with a rapier thrust in his throat. Blumm being inexperienced, some indignation was excited among the citizens against Fournier, who was believed to have dispatched him. Fournier, however, never replied to the indignant murmurs that reached his ears, except by a shrug of his shoulders. -1868 Andrew Steinmetz, in The Romance of Duelling in All Times and Countries (70-78), refers to a story called A Duel lasting Nineteen Years. -1869 Charles G. Shanks, in An Old-Time Duel (553-556), published in the Appleton’s Journal. -1877 Alfred d'Alambert, in Un duel sous L'Empire ou Dix-Neuf années de combats (33-34)3. -1881 In the section “Ecos de la opinión de la audiencia”, “Un duelo en el primer Imperio”, in La correspondencia de España, July 26 (see Figures 1, 2). Figure 1. Le Figaro offered a version of the duel with a certain touch of humor. Figure 2. The Spanish version of the same anecdote in La Correspondencia is a variant of the original story. The historical context of the Napoleonic Wars marks a tipping point in epochal terms, although duels continued to be fought despite their prohibition. The duel persisted through the transition from the Ancien Régime to the Modern era. Thus, the duel becomes a symbol of this change in epoch that is perceived socially and culturally, above all, as an abandonment of inequality. In LaVaque-Manty’s opinion, using Kant as a touchstone4, the custom of the duel, once the patrimony of the aristocracy, is a simultaneous attempt to resist and promote the new, modern value of dignity. The aristocracy cedes its privilege to the middle class, just as the motive for a duel changes. Just as it represents the aristocracy’s conscience and its modes of conduct, the duel makes the new value of dignity substitute for the outdated value of class honor by figuring the contenders as equals (715-716). In short, the duel is an example of the fading Ancien Régime’s practical resistance and, paradoxically, the condition for the implantation of modernity (716). Thus, it is easy to see that the duel transcends its private nature. Society needs this change to happen. In opposition to Napoleon Bonaparte’s regimented system, a paradigm of Enlightenment rationality, the continued practice of the duel appears to contravene the new power, the new way of thinking. The irrationality of the action—the duel occurs without sufficient affront, for there has been no attack, nor insult, nor robbery, nor conflict…only the inopportune communication of an official message to one of the soldiers—encompasses human motivation and the decline of a more spiritual culture that strives desperately to survive despite being condemned to disappear. In his history of the duel in the West, Major Ben C. Truman traces the origins of the duel to the “trials by combat” among the Celts, a practice introduced by the Lombards in 659. According to Truman, “the early duel appears to have been a trial by combat of two individuals for the determination either of the guilt or the innocence of the person charged with crime, or for other purposes of decision” (9). This type of combat, with a long tradition in Antiquity and the Early Middle Ages, was institutionalized with religious overtones (monks and priests accepted, promoted, and supported the fights) and later filled gaps in some codes of law, becoming, in LaVaque-Manty’s words, extralegal (722). LaVaque-Manty asserts that some thinkers, such as Bacon, considered dueling to be pernicious, diabolical, or a kind of disastrous madness (Bacon 305). And, citing an 1855 text by Sabine, he notes that during the Enlightenment the duel began to be perceived as an irrational custom, “a relic of the Dark Ages”, unjustifiable in a civilized world (LaVaque-Manty 717). In 1879 Peru, José María Dorado, a contemporary of the aforementioned accounts, concludes that “(…) the duel is a criminal act belonging only to the age of exploration and barbarity, opposed to the principles of Christian religion, and foreign to the civilization and culture of the century that we live in” (10). Despite the change in mentalities, which sees the duel as unjustified and considers it irrational, it continues to be the emblematic male mode of defending honor (LaVaque-Manty 718) and reputation in the nineteenth century (Shoemaker, 525)5, attributing justice to the hand of Providence (Truman 20-21). In France, the setting for the duel depicted in all three accounts, the practice is presented by and to all those involved as part of a liturgy venerated and consolidated in time, despite the historical cycles of license and prohibition (Truman 19-30). Parts of the ritual have prevailed, listed here as narrative categories in order to analyze the duel as it appears in the various accounts: the challenge, the search for witnesses, the encounter, the refreshment (in some cases), the field of honor, and the attendance of a priest or doctor. The challenge and the duelists are the main elements at the start of the duel. On one hand, the challenge embodies the irrational force of mourning because it encompasses the excess or hubris that pushes the duelists to risk dying for a seemingly minor cause. On the other hand, the duelists are the main characters involved in the combat. The fact that the combat stems from no apparent cause has a particular bearing on the shape of the myth of the duel. Scott’s version begins with an encounter between innocence (represented by a goose girl) and violence (represented by D’Hubert). The action opens with a romantic sequence that ends in a scene in which the officer is a witness to a fatal duel. In the context of the Enlightenment, that there should be action without reason underscores the irrational nature of the duel, converting this element into the mythic thread of both the historical and fictional accounts. However, these narratives do not present the desire to restore honor as the motive for the duel. As Chauchadis notes, honor or pride is an essential element of the duel and is associated with the thirst for vengeance (2). Yet, the story that is told is not a tragic one, as might be expected from one concerning two men who engage each other in duel for years. The journalistic account concludes with Dupont’s wedding and his threat against Fournier, warning him not to provoke him again—not with the death of one of the duelists (Editor's Easy Chair' 560). On the contrary, what the three accounts describe are the motivations of certain individual characters such as Fournier-Feraud, filled with arrogance and obstinacy, who in addition to constituting the “origin” of the duel (and the protagonist that initiates the action in the journalistic account), provokes shock and perplexity and is an example of contradiction within the new order. Indeed, in Harper’s New Monthly Magazine’s journalistic version, Fournier is already described as a quarrelsome man (559). Figure 3. D’Hubert approaches his opponent in Scott’s movie. Under those historical circumstances, so favourable to the proper appreciation of military leisure, Lieut. D'Hubert, one fine afternoon, made his way along a quiet street of a cheerful suburb towards Lieut. Feraud's quarters, which were in a private house with a garden at the back, belonging to an old maiden lady (3). In addition to the importance of the challenge and the duelists in the shaping of the mythical story, there must be witnesses to testify and give credence to the facts. 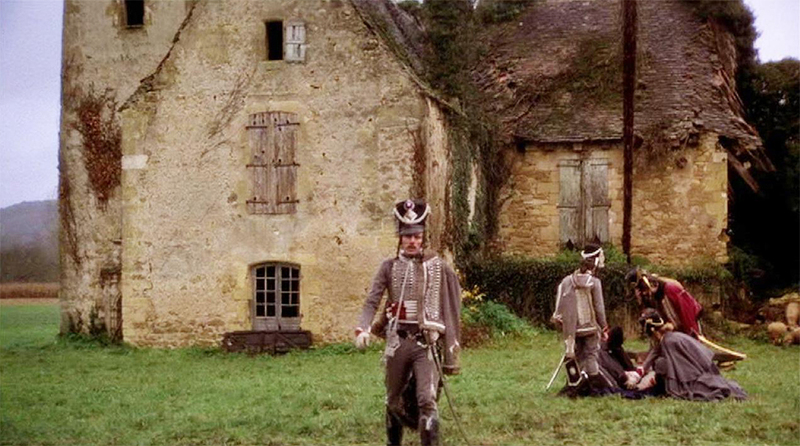 In Scott’s film, the action opens with the re-creation of the duel between Feraud and the mayor’s nephew. This duel is only alluded to in the journalistic and novelistic accounts. 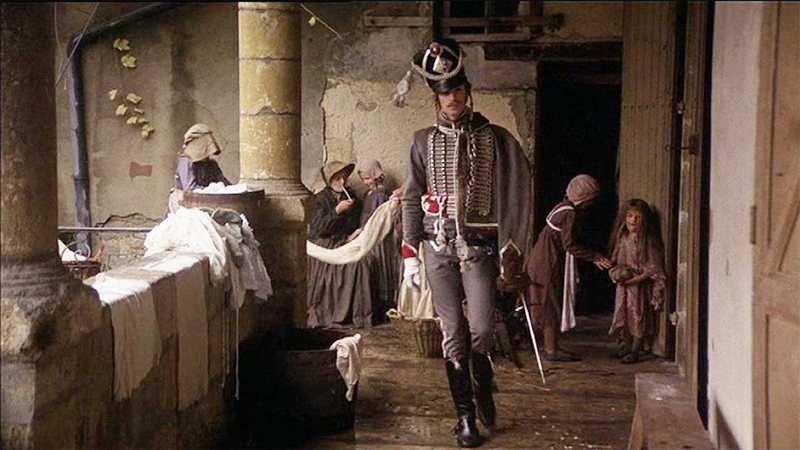 But in the film, Scott offers an imagined representation of the scene to which D’Hubert will also be an indiscreet witness and because of which he will decide to arrest Feraud. 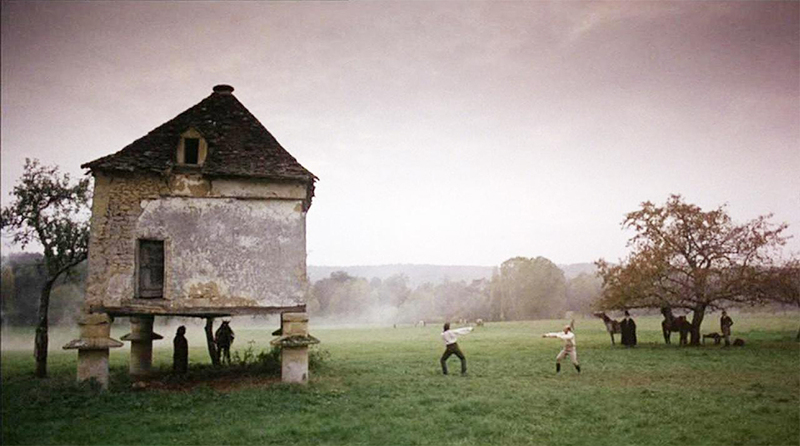 The re-creation generates an atmosphere capable of suggesting the clandestine nature of the duel: it takes place in a rural setting, “the field of honour”, next to an old stone cottage, enveloped in a dense mist and by a thick forest. This is the authentic romantic landscape (see Figure 4). Figure 4. Feraud's concern to bring witnesses to the meeting. The presence of witnesses in the novel and the film contrasts with the journalistic account, where their role is not explicitly referred to. But there is reason to think that there were witnesses, given that someone made a record of the events. 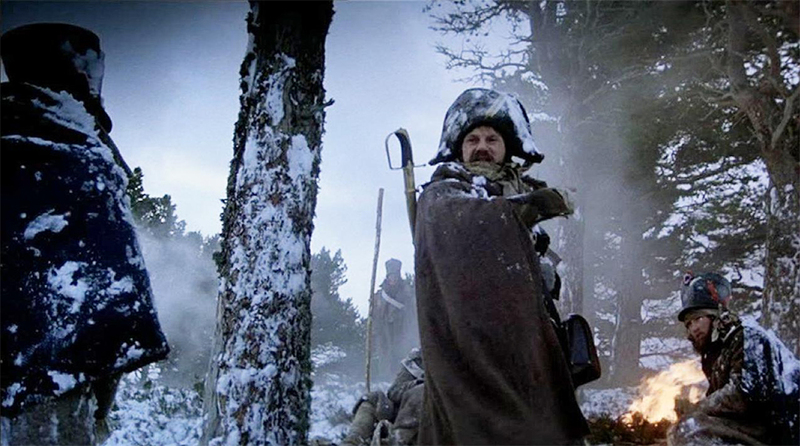 In the film, the presence of the witnesses as part of the ritual fulfills two functions: it is a condition for the duel to occur and it is the reason for the scandal that will unfold in the army when news of the duel is disclosed. 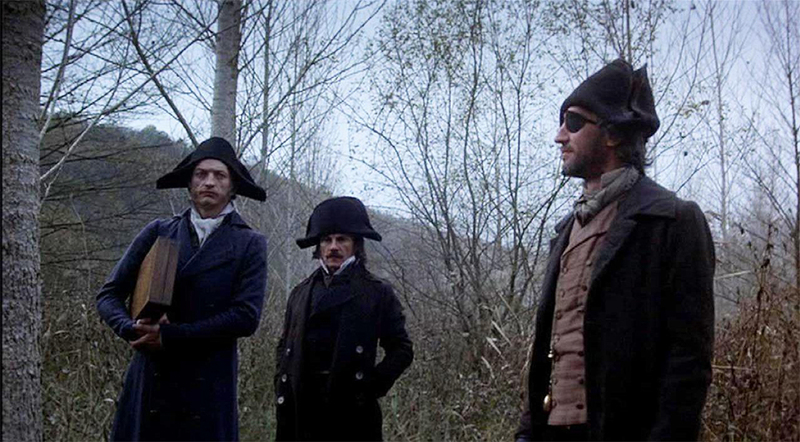 For D’Hubert, reporting the duel to the military authorities condemns him to ruin along with Feraud, turning him into an informer and a scapegoat. In a foreshadowing of the duels that they will face, the film underscores the first intimidating conversation between the two soldiers. From a romantic point of view, the encounter seems to be an iconic revisitation of honor and represents the climax of the fight. In other words, we can say that there is no duel without the encounter. The encounter is a sign of commitment: every time they meet in duel the rivals risk death. But in heroic terms, the representations of the duel that Conrad and Scott depict are based on the discontinuation of the practice of dueling: that is, on its secrecy, since the narratives inspire melancholy vis-à-vis the disappointment experienced during the change in epoch and the prohibition that disrupts the free flow of passions. The fact of their prohibition makes their enacting seem inevitable. Until then, men were valiant because they were ready to lose their lives for a virtue, for a promise, for an offense. To forgo the engagement—even if in deference to the law—implies dishonor. That is the dramatic conflict that magnifies the character Fournier-Feraud with respect to Dupont-D’Hubert: although the latter wishes to escape and retain his valor, he cannot do so. The particular confrontation of the duelists, small and clandestine, may be interpreted as a challenge to a nation that is changing: it is the Napoleonic system that is being challenged. In this sense, Conrad’s account is ironic. By comparison, Scott’s film seems committed to perpetuating the aesthetic dimension of the duel as a kind of museum piece. This subjective element in Scott’s vision, which is more complex than Conrad’s narration, makes the story more anti-dramatic (see Figure 5). Figure 5. The space envelops the encounter in a dreamlike atmosphere. Another topos of the mythical composition of the duel from a narrative point of view is the space and time for refreshment. The scenic composition of the “refreshment” in Scott’s film is especially appealing. Indeed, the atmosphere in the film becomes one of its main players. The aesthetic element, which consists in wanting to re-create the environment, the way of life, the human landscape, and even the epoch’s aura, outweighs the plot and the reliability of the narrative. The historical factor is minimized and, instead, the sophisticated manner of living, the detailed recreation of rooms, tableaus, scenery, buildings, and everyday scenes are highlighted. In this way, the film is similar to a mannerist study in which each stage in the artistic reconstruction of history involves an original creative act or cautious attempts to emulate Napoleonic era works of classical art. “Art for art’s sake” superimposes a stylized image over history, giving the impression of normality through an exquisitely constructed depiction. By contrast, this aesthetic dimension is almost nonexistent in the journalistic account and Conrad’s novel (see Figure 6). Figure 6. The time for refreshment is respected in the film as it is part of the ceremonial. A priest and/or a doctor are often included at the scene of to tend to the duelists. Scott’s film recovers this traditional duel scene. The doctor and the priest both appear according to custom. The first is there to treat life-threatening wounds; the second to give last rites in case of imminent death. The cinematographic care given to this double sign of tradition confirms the acceptance of elements that are incomprehensible even for a later reinterpretation, but essential as mythic icons (see Figure 7). Figure 7. Medical aid is also planned because the duelists may not want to destroy their enemy. The field of honor is a sacred place to die. That’s why the features of the dueling field as a place must be special: an isolated place, sometimes in ruins, at other times, deep in a forest, but one way or another, a hidden place, not easily discoverable. 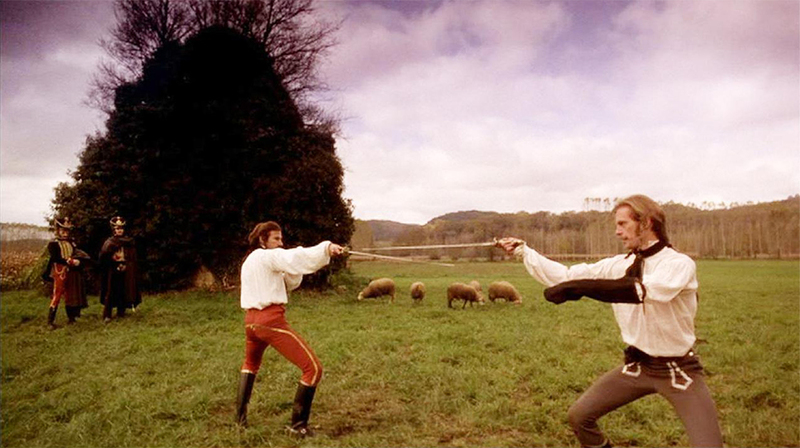 Lastly, from the moral perspective, it is noteworthy that the ground upon which the duels are fought (Le Fenestre and d’Agay fight seven times, while the protagonists of the novel and film do so four times) is designated “the field of honor”: duel and honor are, thus, identified in spatial or material terms. Blood stains the character of the duel landscape, a key moment in the mythologizing of the events that take place there. Honor is the logic that gives meaning to duel actions and events. The “field of honor” is the space that bears witness to this practice, as the “field of battle” does to war. Scott takes special care of this space, thus strengthening the romantic and stylized vision of the act. Together with the duel, the field of honor is made mythic: it must be outside the city, enclosed by forests, near ruins or abandoned buildings. It must give a certain visibility to the duelists (see Figure 8). Figure 8. The beauty of the duel is based in part on fighting with sportsmanship and style. This exploration of the historical anecdote that gave rise, first, to a novel, and later, to a film version, discloses two key aspects of how mythologization occurs in general, and how the story of this duel has been mythologized, in particular. With regard to the former, there is an irrational element and a poetic dimension to the process of mythologization in general, which is congruent with Blumenberg’s view of myth as being defined by the categories of terror and poetry (15). In this particular case, the newspapers recorded an extraordinary story and exploited its sensational and thrilling features to notable effect. From within the anecdote of the duel between two soldiers, Conrad traced a mannerist framework with which to shape a story about historical transition; to this end, the writer focuses on the details of everyday life, the psychological make-up and worldviews of the characters, without losing sight of the apparent meaninglessness of the action – that is, the irrational basis from which it stems. Nevertheless, the story’s irrationality is only apparent; in fact, it is rooted in the clash of two world orders: legal Reason versus a culture wherein the duel is the means by which Honor is safeguarded. Finally, Scott offers an essentially aesthetic experience, highlighting the romantic dimension of the story – ‘an epic of honor’ – and presenting the melancholic emotional sensibility of each scene in a visual and sometimes even anti-dramatic way as we have seen. A further conclusion, from a narrative point of view, is that the mythologization of an historical event may be better understood as a hermeneutical process that encompasses social, cultural and artistic concerns. The social dimension assesses the moral significance of the values put into play in the historical event (in this case, the importance – or irrelevance – of Honor and reputation); the cultural dimension, on the other hand, addresses the extent to which such values were socially (un)acceptable at the time, which shapes the genre of storytelling at each point (from an entertaining journalistic anecdote about sword-play to mannerist novel, to romantic melodrama); and finally, the artistic dimension aims to invest human experience with meaning by casting light or shadow on aspects of the story in line with the overall narrative approach (see Figure 9). Figure 9. The portrait of Feraud evokes the historical image of Napoleon Bonaparte. There are a number of differences between the documents and narratives discussed in this paper. While the brief story published in Harper’s Magazine dates the duel to the years 1794-1813, both Conrad’s novel and Scott’s film set the start of the dueling in 1800, to coincide with Napoleon Bonaparte’s rise to power in France. Conrad’s novel reads as a metaphor for the story of Europe. Both Conrad and Scott also change the names of the main characters. Although such changes may seem to be of little importance, it is worth noting the initials of the characters’ surnames remain unchanged across all versions, including the newspaper accounts, reflecting a concern perhaps to ensure the historical authenticity of the story in all its forms. In the newspaper report that most likely inspired Conrad’s novel, the dueling antagonists are DuPont and Fournier, whereas in Conrad’s book and Scott’s film they are known as D’Hubert and Feraud. Thus, the historical narrative flows into the mythological narrative. Despite the hermeneutical differences evinced between the versions, the myth or reason underlying the story remains present in the same way: no single reason can account for the reasons of Honor. Depending on how it is viewed, the duel is an act of obstinacy or fortitude – perhaps even both at the same time. This is the main contradiction that validates the ‘duel as myth’: its simultaneous rational and emotional charges. Paradoxically, the meaninglessness of the original affront renders such irrationality meaningful: there are some actions a man must undertake for their own sake, and which makes them great, even though they are forbidden by the Law. The new regime has met with a poor reception, while the old way of the duel remains socially acceptable and is associated with brave and admirable men. A tragic note is sounded by the fact that the duel is dangerous, a regrettable madness, and has no place in a new world that has lost faith in its ideals and is fading away. I would like to thank the staff of the Interlibrary Loan Service at the University of Navarre as well as the Research Project MYHE (Mythmaking and Heroism in Media Narratives) for its financial support. 1 In fact, and as will be explained in the corresponding section, at least five nineteenth-century versions about a duel have been found that present abundant similarities with Conrad’s novel. 2 Ferguson also mentions the comic character that Conrad adds to the story thanks to the introduction of the little mirror of “vanity”. 3 d'Alambert previously described the duel in his book Physiologie du Duel, Paris,1853. 4 LaVaque-Manty cites Kant’s work (Metaphysics of Morals and Anthropology) because his “conception of a person requires that for someone to have dignity in social life, he must respond to challenges to that dignity, and the relationship of social equality that dueling involves provides a model for this theory”. 5 Shoemaker holds that the practice of dueling persisted in England until 1852, when violence began to be gradually replaced by new social strategies to protect one’s reputation. Andrew, D. T. The code of honour and its critics: the opposition to duelling in England, 1700-1850, Social History, Vol. 5, issue 3, 1980; 409-434. Bacon, F. The Charge Touching Duels. Major Works, Oxford: Oxford University Press, 2002. Blumenberg, H. El mito y el concepto de realidad, Barcelona: Herder, 2004. Chauchadis, C. Libro y leyes del duelo en el Siglo de Oro, Criticón, 39, 2, 1987. Conrad, J. El duelo. Barcelona: Alfaguara, 1977 (1907). --- J. The Duel. A set of six. Recurso electrónico Biblioteca Unav, 1907.
d'Almbert, A. (1877). 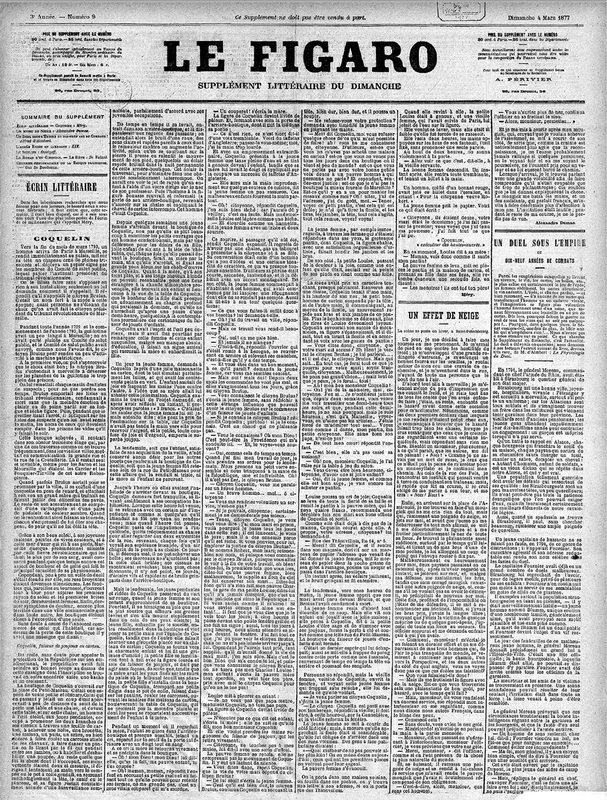 Un duel sous L'Empire ou Dix-Neuf années de combats, en Le Figaro's Supplément Littéraire du Dimanche, March 4, 1877; 33-34. ---. Physiologie du Duel, Paris, 1853. Dorado, J.M. El Duelo, Perú: Universidad Nacional Mayor de San Marcos, 1879. Duffy, C. The Military Experience in the Age of Reason. Taylor and Francis eLibrary, 2005. Editor's Easy Chair'. Harper's New Monthly Magazine, September, 1, 17. Periodicals Archive Online, 1858; 559-560. Ecos de la opinión de la audiencia, Un duelo en el primer Imperio. 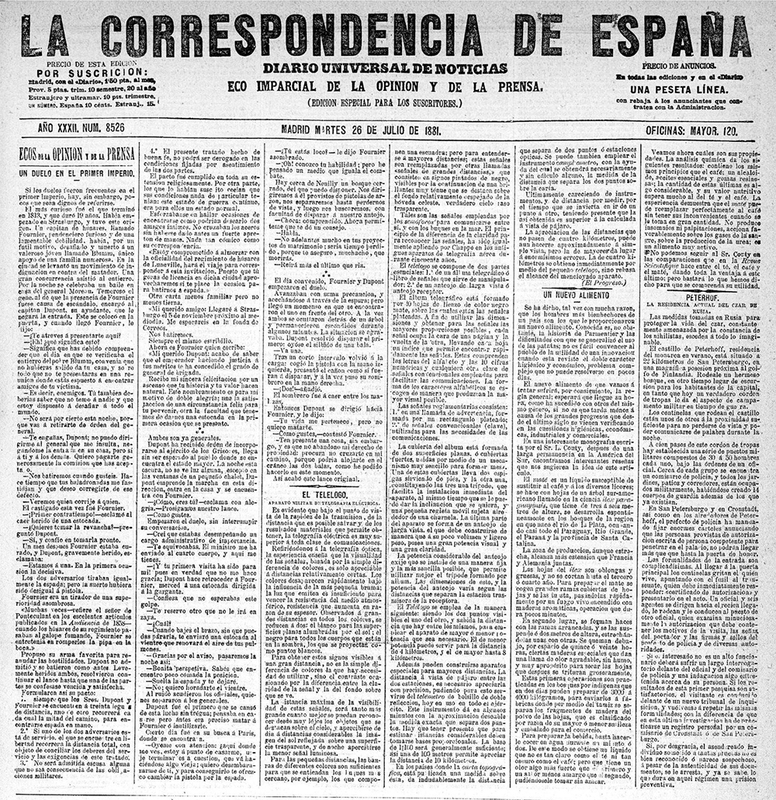 La correspondencia de España, julio 26, 1881, portada. Ferguson, J.D. The Plot of Conrad’s The Duel, Modern Language Notes, Vol. 50, No. 6, junio, 1935; 385-390. Kennett, L. The French Armies in the Seven Years War: A Study in Military Organization and Administration, Duke University Press, 1986. LaVaque-Manty, M. Dueling for Equality: Masculine Honor and the Modern Politics of Dignity, Political Theory, Vol. 34, nº 6, December, 2006; 715-716. Ricoeur, P. Historia y narratividad. Barcelona: Paidós, 1999. Shanks, ChG. An Old-Time Duel, Appletons’ Journal of Literature, Science and Art, Volume 1, Issue: 18, julio 31, 1869; 553-556. Shoemaker, R. B. The taming of the duel: masculinity, honour and ritual violence in London, 1660-1800, The Historical Journal, Vol. 45, issue 3, September, 2002; 525-545. Stape, J.H. Conrad's 'The Duel': a reconsideration, The Conradian 11.1, 1986; 42-6. Stape, J.H. & Peters, JG. Conrad's “The Duel”, Leiden: Brill/Rodopi 2015. Steinmetz, A. The Romance of Duelling in All Times and Countries, vol. 2. Chapman and Hall, 1868. The Duellists. Dir. Ridley Scott. UK. 1977. Truman, B.C. The Field of Honor: Being a Complete and Comprehensive History of Duelling in all Countries. New York: Fords, Howards, and Hulbert, 1884.